This is a delicious way to use your leftover Corned Beef and Cabbage for breakfast. I even add chopped cabbage to this and it makes the dish even more tasty and filling. Step 1 In a large pan (preferably a cast iron skillet) on medium heat, melt butter and coconut oil. Step 2 Add onions and cook until translucent. 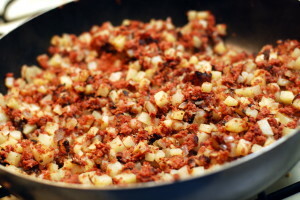 Step 3 Add corned beef, parsnips and sweet potato to pan and turn heat up to high or medium-heat. Step 4 Spread the mixture our evenly over the pan and use a metal spatula to gently press down the ingredients. This will create the golden brown crust we love! Step 5 When nicely browned, flip the mixture over and brown the other side. Try to avoid stirring or mixing because it will prevent out crust from forming. Step 6 Serve with a few cracks of fresh black pepper and garnish with your chopped parsley.